FDA-approved wrinkle relaxers and dermal fillers that lessen and minimize dynamic facial lines and folds. Noninvasive and modern fat reducing treatments that create a thinner and leaner silhouette for your body. Photofacials that utilize broad band light technology to reduce the appearance of unsightly skin blemishes. Modern skin care treatments that work to tighten your skin for a firmer and rejuvenated appearance. Nonsurgical procedures that significantly diminish signs of aging and restores your youthful profile. Medical-grade skin care products that nourish, moisturize, and improve damaged, dull, oily, or dry skin. Sherri Alford, Licensed Medical Esthetician is highly trained and certified in Scitcon®BBL photofacials, and Venus Legacy™ skin tightening treatments. She also brings years of experience and skill to every customized facial and skin rejuvenating treatment she performs at the MedSpa. As our lead Esthetician, she is very knowledgeable in all the SkinMedica® and Rhonda Allison® skin care products offered at our spa. During patient consultations, Sherri applies her expertise to evaluate and recommend the best treatment possible to achieve the desired results. Emilee Perkins, Nationally Registered Certified Medical Assistant and Coolsculpting Specialist provides expert assistance to our nursing staff and patients before, during, and after treatments. She is a great asset to the MedSpa as she utilizes her skills and friendly bedside manner to not only assist the Nurse Injectors with treatments but also works with our patients to provide personal assessments and customized Coolsculpting treatments for non-invasive fat reduction. She holds certifications in Sciton® BBL, Eclipse Micropen™, CoolSculpting®, and Venus Legacy™ treatments. Karen Wiltin, Physician Assistant serves our patients with great attention to detail, patience, and care. As a talented and professionally trained Physician’s Assistant, she provides expert experience and quality service to every treatment she performs at our MedSpa. As a seasoned injector, she offers Botox and filler injections to our patients who are seeking a more youthful, relaxed, but natural appearance. Karen takes her time to listen to every patient’s needs carefully and thoroughly to ensure an understanding of their cosmetic goals and needs. Safe, optimum, and natural results are her top priority. 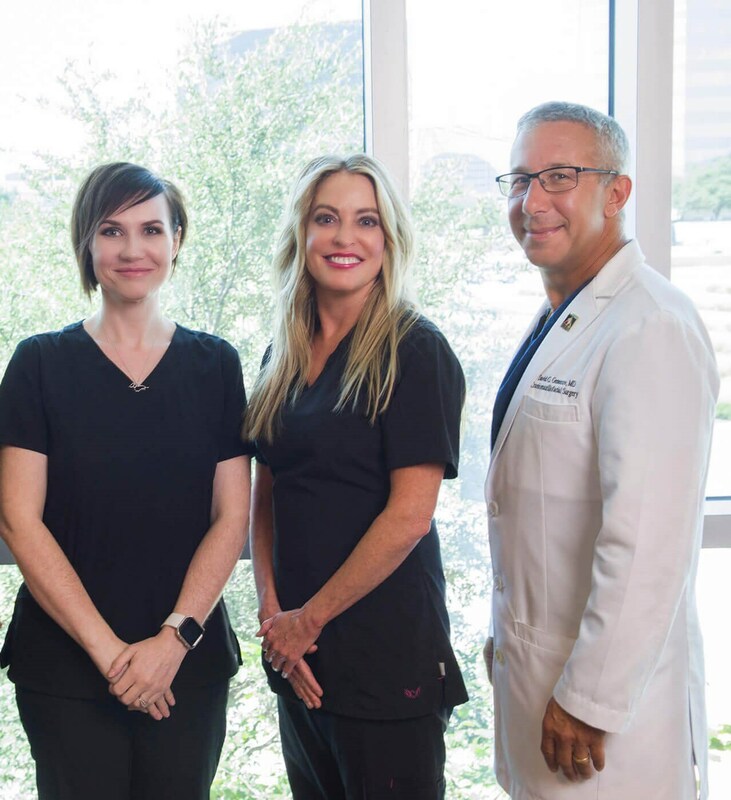 The Bloom Medical Spa is a state-of-the-art medical spa in the greater Northeast Dallas area and is conveniently located on Interstate 75 just north of Forest Lane in North Dallas. We are directed by Dr. David Genecov who is a board certified Plastic Surgeon and Craniofacial Surgeon. Dr. Genecov and his medical staff are connected to our spa next door, unlike many medical spas that do not have access to a physician on the premises. This means our facility is safer and more efficient when it comes to performing rejuvenating skin care services. Our facility offers a relaxing, spa-like atmosphere with a welcoming reception area, injection rooms, facial rejuvenation room, and CoolSculpting room. We invite you to tour our modern and welcoming facility to learn more about our many features. VictoriaS - I had pharyngeal flap surgery made by Dr. Genecov. I'm 32 years old and had been having hypernasal speech for the whole life - I was born with a cleft palate and had not the best surgery when I was a child. Even though it wasn't an easy task to fix it on an adult, Dr. Genecov did a great job, I already sound and feel better. His office staff is nice and professional, he treats his patients with care and kindness. I had to go to Dallas TX to have all of this done, but it did pay off.Highly recommend this doctor. It's very rare to have pharyngeal flap done on an adult so this doctor is a gemstone. Everyone was so kind. Sherri was absolutely amazing! Definitely recommend. Dr. Genecov has taken care of our daughter since the day we found out she would be born with a cleft lip. I have nothing but praise and gratitude for the care we have received and the amazing job he has done over the past 15 years. We have trusted him explicitly and he has never disappointed us. Dr. Genecov is the best of the best!!! Very polite and straight to the point and he knows what he is capable of and gives you realistic expectations. The Bloom Medical Spa is proud and excited to offer The Brilliant Distinctions® Points Program and the ASPIRE Galderma® Rewards Program. These programs are the official customer rewards program offered by Allergan®, the makers of Botox®, Juvederm®, Restylane®, Restylane® Refyne/Defyne, Sculptra®, Dysport® and other well-known cosmetic treatments. When you join this exclusive loyalty program, you’ll earn reward points every time you receive injectable treatments or make a SkinMedica® purchase at our practice. The points you earn can be redeemed at any time for instant savings on future injectable treatments or SkinMedica® products. As an elite MedSpa in greater Northeast Texas, The Bloom Medical Spa offers quality cosmetic services and treatments. For years, our team has improved its high standard of care, expanded its knowledge on the most advanced procedures, and has worked diligently to practice the highest level of safety. Our staff is dedicated to providing the best cosmetic enhancements and medical treatments possible, and are deeply committed to customer satisfaction. We invite you to meet our staff, tour our facility, review our patient feedback, and explore our many procedures. Please also feel free to contact us at any time to schedule a complimentary consultation.